This is a follow-up post of my last post "Water Bus." The above photo shows the mouth area of the Sumida River. 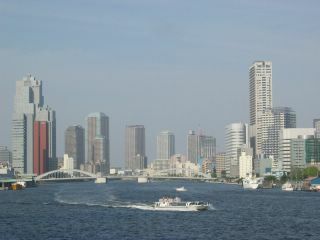 There are many rivers in Tokyo, but the Sumida is especially interesting. It runs through many famous areas of Tokyo, such as Asakusa and Tsukiji. In the photo above you can see many tall buildings. The ones on the left and right are mainly office buildings. In the center you can see some condominium towers. These massive "manshons" (as Japanese call them) are very common in the Tokyo area. The Sumida River bank is becoming a popular place to build condos. It's also a great place to take a walk on a sunny day. However, according to this article (pdf) the Sumida was once considered a dirty industrial area in the past. It certinaly has changed. As I said in the previous post, taking a water bus is a great way to see this area!